Version 1 Colored in EQ by Anita Peluso, Pattern by Lori Smith. Version 2, Blue Border. Center is changed. Block One, pieced by Nancy Richwine. Read about making flying geese blocks. 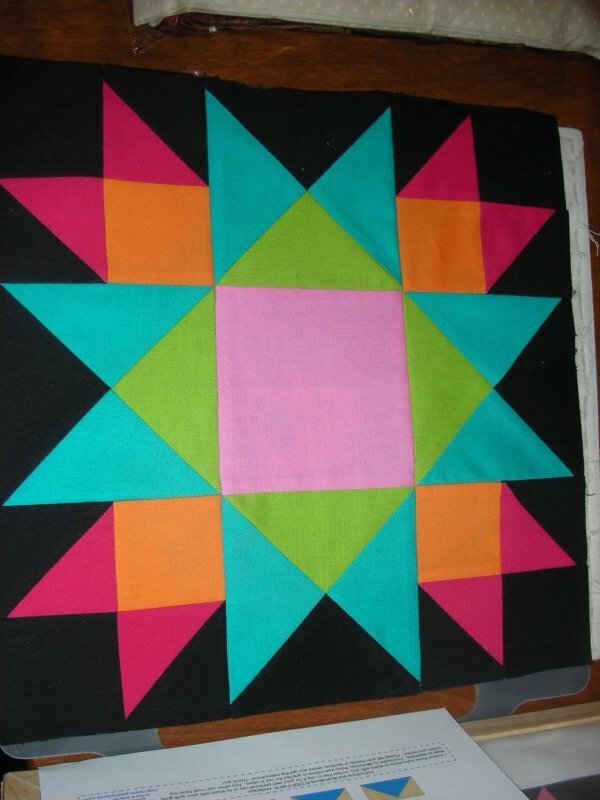 Ellen's stunning 32 block sampler done with this pattern and brights. Sign up Now for our Saturday Sampler 2012. Pattern by Lori Smith, From my heart to your hands. 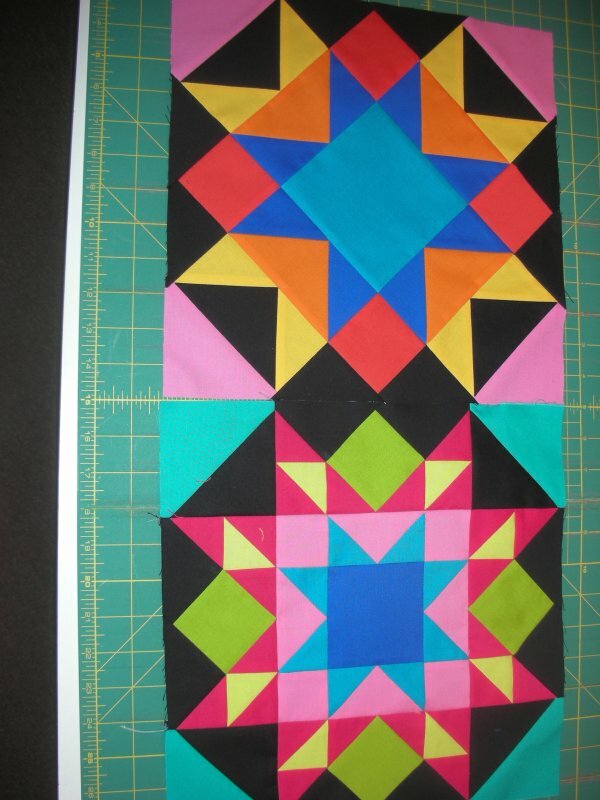 Colored in Electric Quilt by Anita Peluso. Pictured here for pattern purposes only. 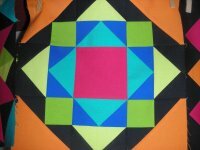 Our quilt will be done “Amish style” using only the finest colorfast, brightly colored solids on a black background. Our featured palette for 2012. Ten colors on a black background. Order your finishing kit today for sashing, cornerstones, borders and binding. Backing kits are also offered in this palette. Thank you. June, July & August blocks, 2012. November and December Blocks, top to bottom. 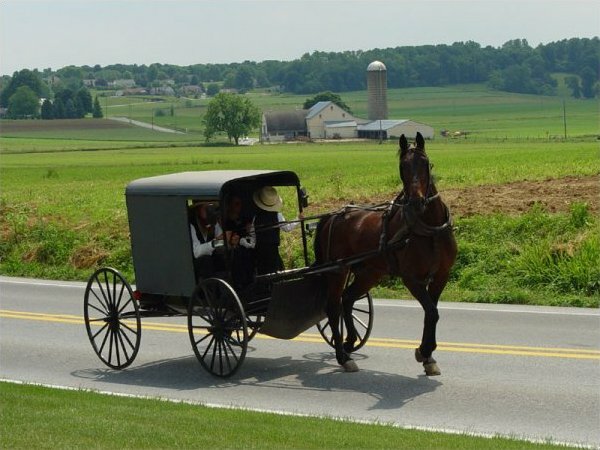 Join us for our Amish Kick Off, Saturday, January 7th. 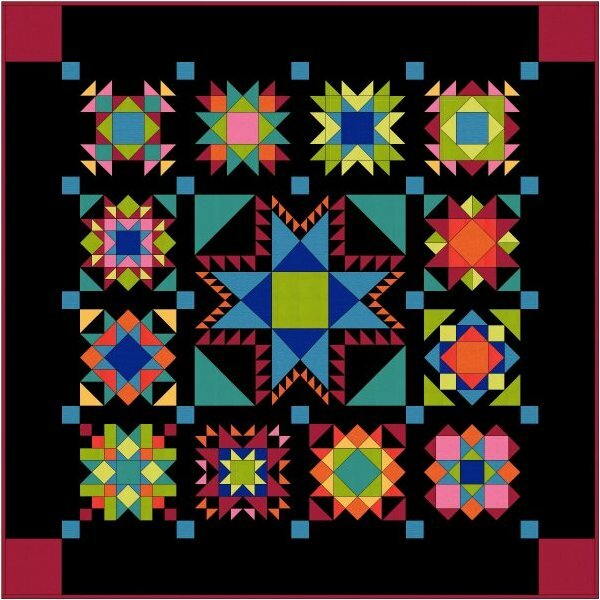 Learn more about Amish Quilts and pick up Block One for this our Tenth Anniversary Sampler. We'll be open at 9am for block distribution and Amish fare. 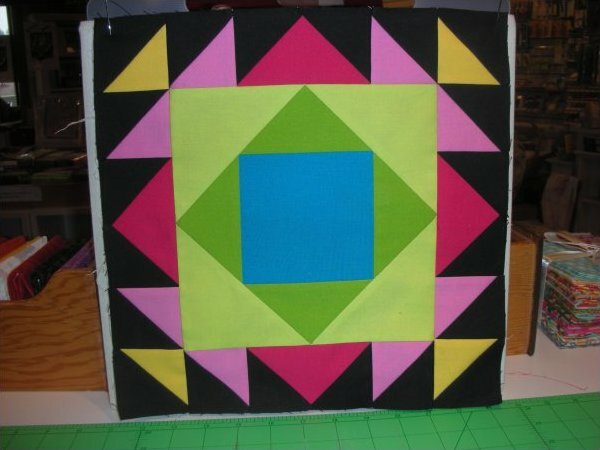 Learn the piecing of this block using flying geese units and half square triangles. We'll have lots of brightly colored solids for amusement and ideas for additional projects. Useful tip: Make a practice block from fabric from your stash for charity or a second quilt. The Amish pieced with simple, solid fabric, yet produced warm, soft and swaddling minimalism. "To make a quilt you take three pieces of cloth - top, bottom and filling in between - and sew them together to make a kind of padded blanket. A simple idea that leads to strange and exalted complications, takes thousands of woman-hours and has much to say about American history." 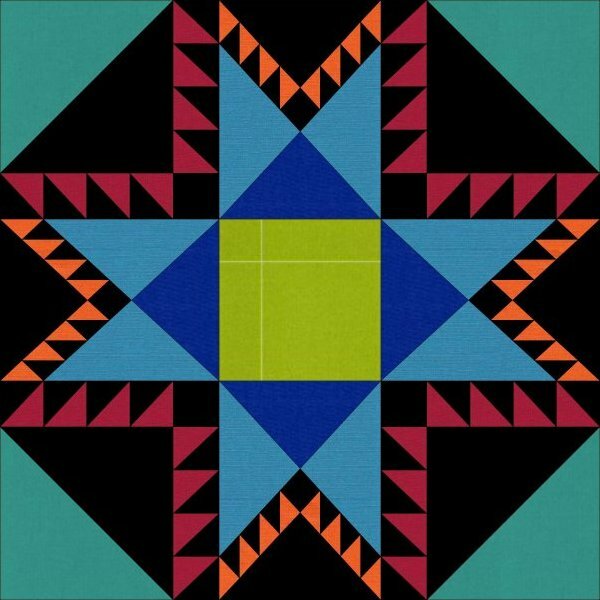 Robert Hughes from Amish, The Art of the Quilt. 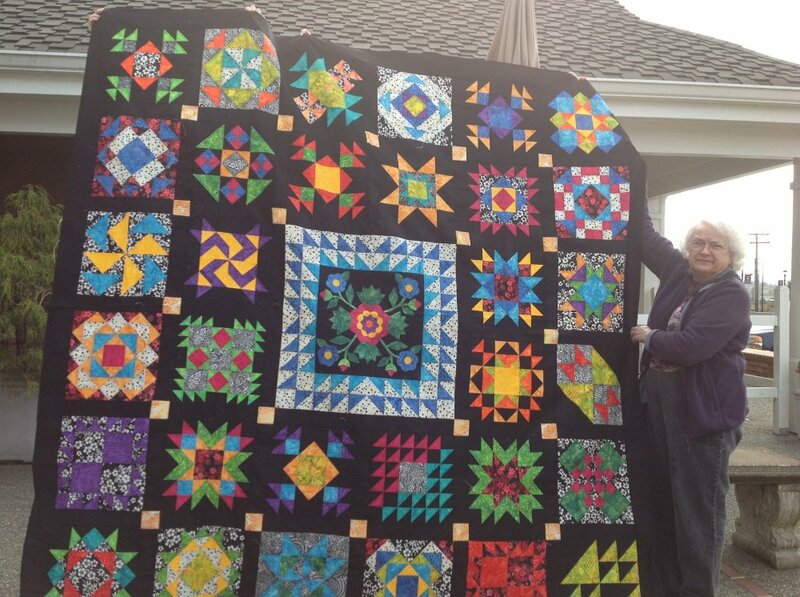 Let's begin this year of appreciation for Amish Quilts. Grandmother’s Sampler Quilt, from the Family and Friends BOTM pattern. By Lori Smith, From my heart to your hands. We’ve worked with Lori’s patterns before and we love them. Her directions are thorough and accurate. 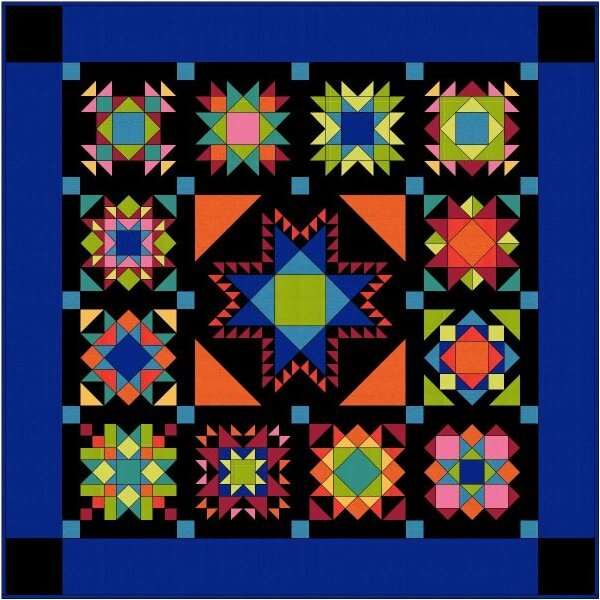 You’ll appreciate the straightforward piecing and finishing directions she provides in her quilt patterns. 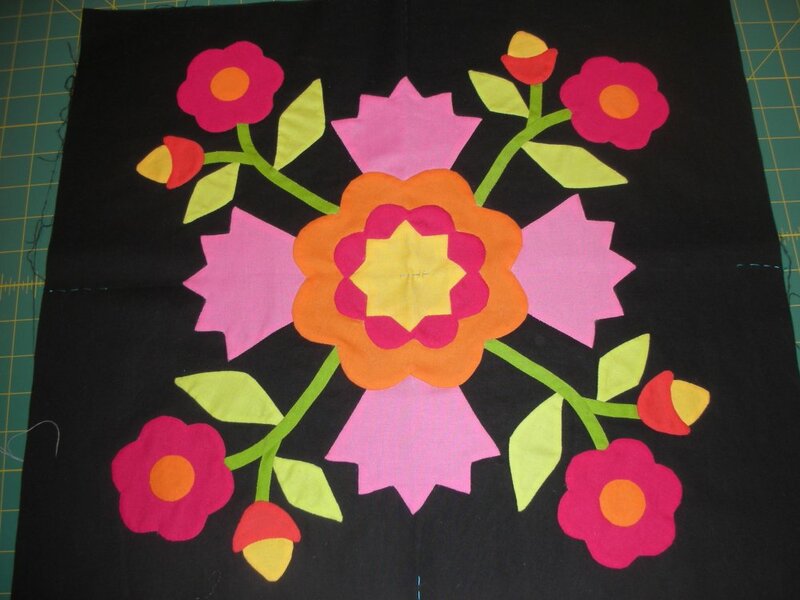 The center is pieced, but an appliquéd center is an option provided in your pattern. We invite you to do either center for a stunning effect. 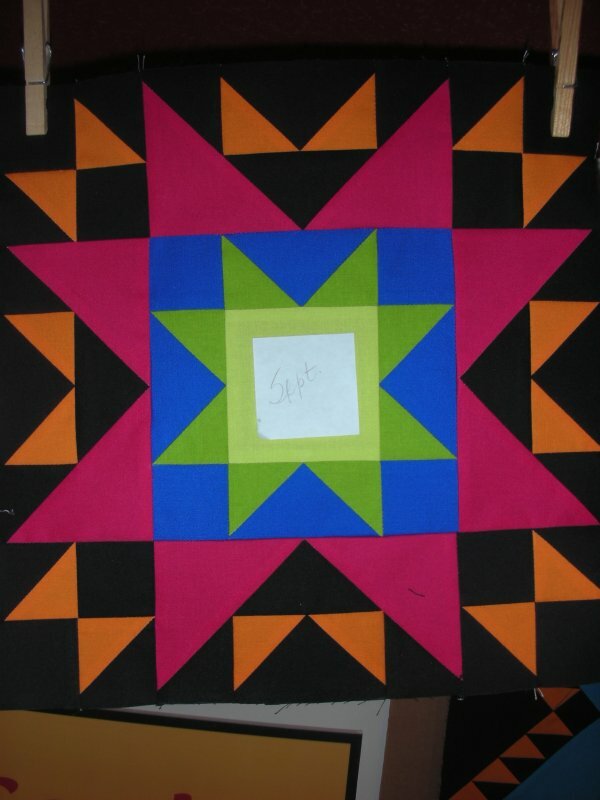 Our shop kits will focus on the center-pieced star. 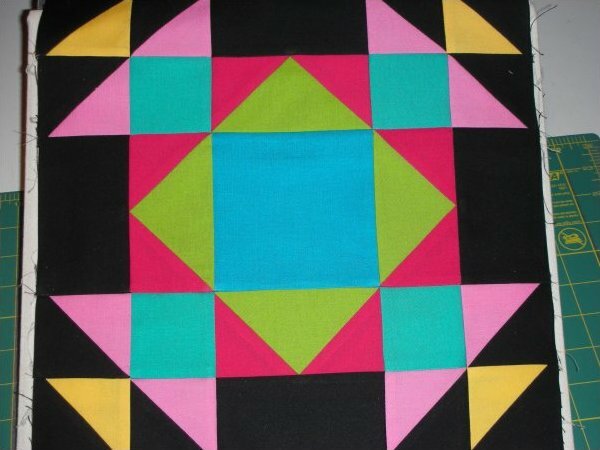 This 12-block sampler quilt, 73 x 73, will begin the first Saturday in January 2012. Sign up’s will start in October at Gathering Fabric Quilt Shop. The cost of the sampler is $84.99 plus tax. 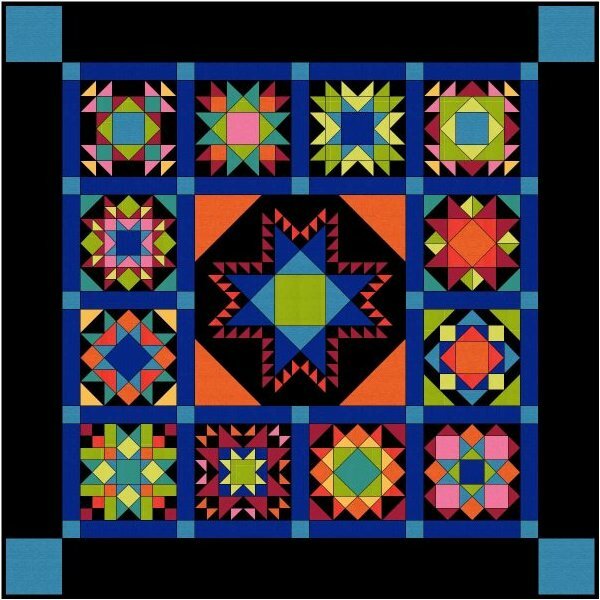 This includes your complete pattern packet and all the fabric to make the 12 quilt blocks and center star block. *The only extra’s you will need is the finishing fabric for the sashing, corner stones, border, binding and of course backing. We want you to be able to choose your finishing fabric in the color you desire. 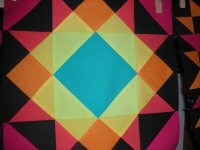 We’ll show you some color options drawn up in Electric Quilt. This fabric will be available at the quilt shop in the palette we are working from. 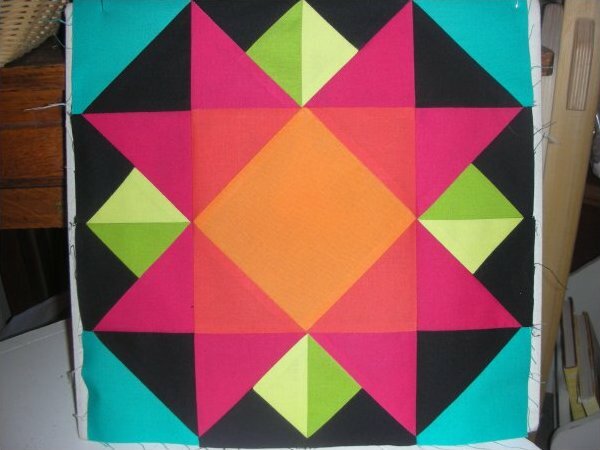 We’ll use deeply saturated, brightly colored solids from “quilt shop only”, top shelf manufacturers. 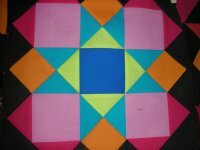 The quilt, Amish in style, will be bright and beautiful as is seen in many contemporary style quilts. We’re excited to offer it to you. 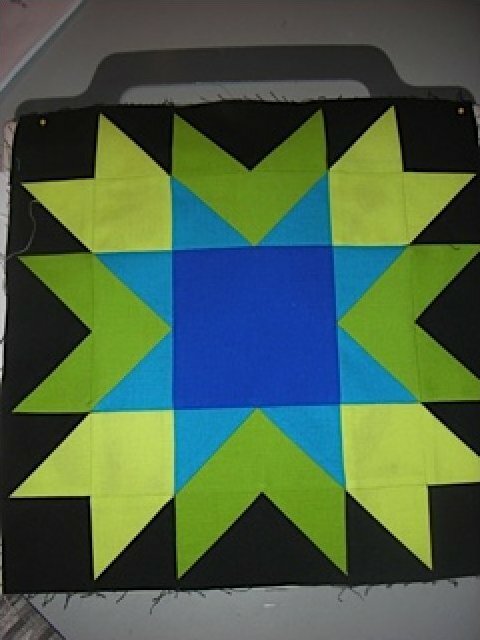 The center star is easily pieced, no set in seams (kits will be provided in the program fee). The optional appliquéd center (kits provided for a fee) can be done by hand, machine or the fusible method. Either method is acceptable. Here’s where your quilt can be unique. 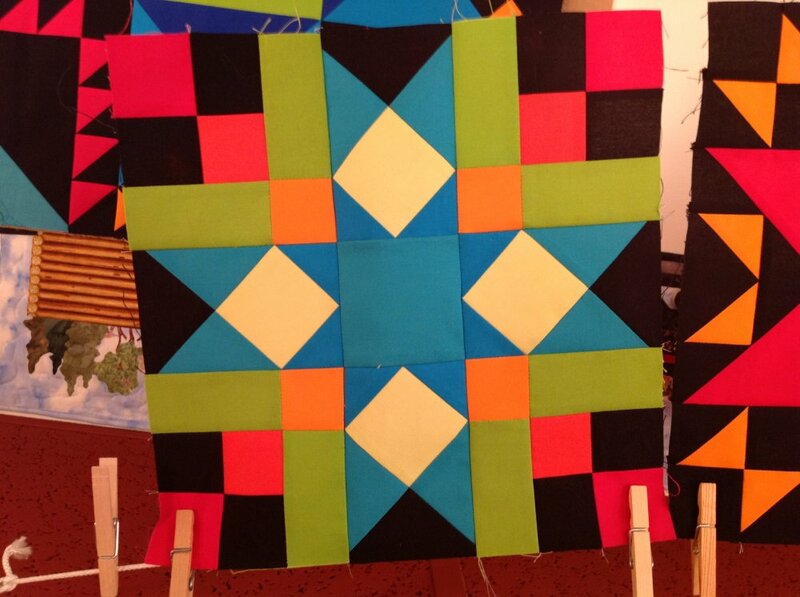 Imagine this quilt pieced to perfection and quilted with bright-variegated thread. Your final composition will be a delight to your family or friends. We hope you’ll sign up today. For the No Waste Flying Geese Method, see patchpieces web site.